Engineered, wide-area subsurface distribution mechanisms significantly reduce the number of injection points and events required. Three stage; immediate, mid-range and long-term controlled-release of lactic, organic and fatty acids for the steady production of hydrogen for optimized enhanced anaerobic biodegradation. Incorporates Proven (HRC®) Technology Successfully applied on over 2,500 sites worldwide. 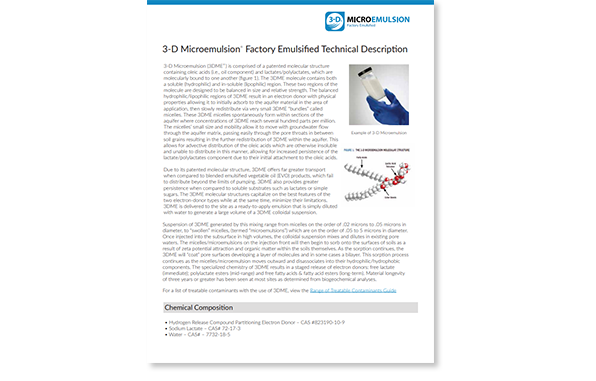 3-D Microemulsion® is an injectable liquid material specifically designed for in situ remediation projects where the anaerobic biodegradation of chlorinated compounds through the enhanced reductive dechlorination (ERD) process is possible. 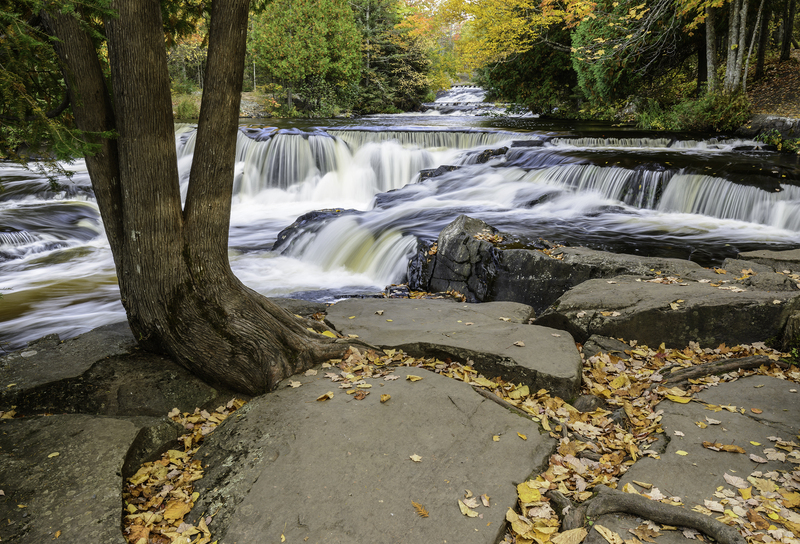 ERD is the primary anaerobic biological process by which problematic chlorinated solvents such as tetrachloroethylene (PCE) and trichloroethene (TCE), dichloroethene (DCE) and vinyl chloride (VC) in groundwater are biologically transformed into less harmful end products such as ethene. Due to its purposefully engineered structure, 3-D Microemulsion exhibits unique subsurface distribution characteristics which allow it to propagate widely within the subsurface. As a result, 3-D Microemulsion can treat a wide-areas around an individual injection point saving both time and money as it relates to the number of application points required. Building on the 3-D Microemulsion engineered molecular structure, this product is designed to provide three unique electron donor materials in a single product. This design produces a beneficial and sequential, staged-release of its three individual electron donor components (Figure 2). This results in an immediate, mid-range and long-term, controlled-release supply of organic acids to fuel the ERD process. Staged-release offers the ERD optimizing benefit of supplying just the right amount of electron donor needed for periods of up to 2-4 years on a single application. Without staged-release technology the ERD process is forced to sub-optimally speed up, then slow down or even stop in some cases. This negatively affects contaminant degradation efficiency and rates leading to longer project timelines and potentially higher volumes of commodity electron donor usage. 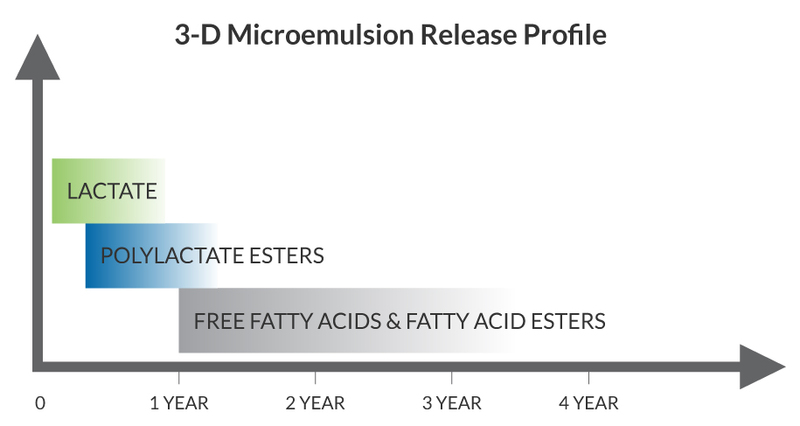 What is 3-D Microemulsion® (3DME)? 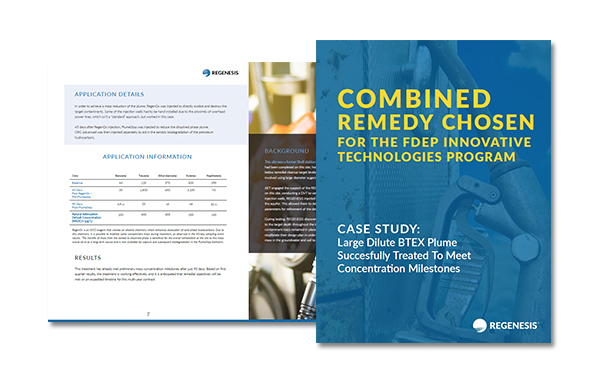 3-D Microemulsion® (3DME) is an injectable liquid material specifically designed for in situ remediation projects where the anaerobic biodegradation of chlorinated compounds through the enhanced reductive dechlorination (ERD) process is possible. How does 3-D Microemulsion (3DME) work? 3-D Microemulsion (3DME) is an injectable liquid material which aids in the anaerobic biodegradation of chlorinated compounds. This product provides three unique electron donor materials which produce a beneficial and sequential, staged-release of each individual electron donor component. 3DME exhibits unique subsurface distribution characteristics which allow it to propagate widely within the subsurface. As a result, 3DME can treat wide-areas around an individual injection point saving both time and money. How do I know if 3-D Microemulsion is right for my project? 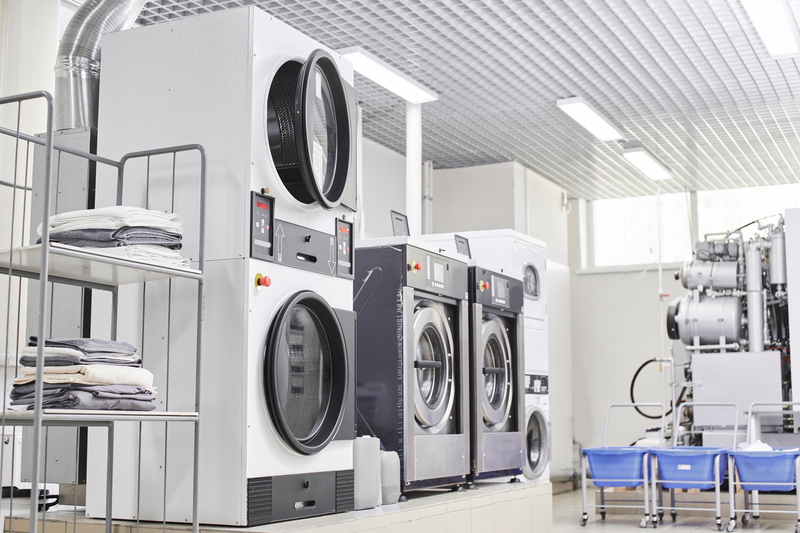 3-D Microemulsion is right for your project if you are looking for a long-term source of staged-release hydrogen to aid in the anaerobic biodegradation of chlorinated compounds.